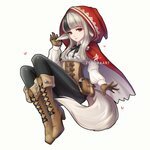 Velour (ベロア, Velouria in the English version) is a playable character in Fire Emblem if (Fire Emblem Fates). She is voiced by Arakawa Miho in the Japanese version and by Angela Maria Volpe in the English localization. Velour is the daughter of Flannel. She loves everything about her father, to the point that it is almost obsessive.